In 1837, Congress authorized the construction of the U.S. Marine Hospital in Louisville “for the benefit of sick seamen, boatmen, and other navigators on the western rivers and lakes.” In the parlance of the day, “western rivers and lakes” referred to the Ohio and Mississippi river systems, and the Great Lakes. All classifications of river workers were eligible for treatment. Every mariner, including pilots, captains, cooks, pursers, engineers, stevedores, roustabouts and deckhands, were eligible for treatment and care. It is estimated that one-third of the patients were African-Americans. 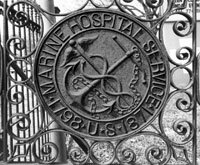 The seal of the Marine Hospital Service honors its founding by President John Adams in 1798 and its conversion to the Marine Hospital Service in 1871. The seal was designed by America’s first Surgeon General, John Maynard Woodworth, and features a caduceus crossed with a fouled anchor. A fouled anchor represents a seaman or boatman in distress. The caduceus is the symbol of Mercury and was used by ambassadors as a sign of peace. It is also associated with trade and represents the Service’s long relationship to merchant seamen and the maritime industries. Click here to view a Historic Timeline!